I still remember being scared shitless by this movie in my early days. In the near future, the crew of the Nostromo has to investigate a signal from a derelict spaceship. Unfortunately, the crew picks up an alien lifeform. The lifeform evolves an starts killing the crew one by one. This was Sigourney Weaver's first movie, and she does a good job as the young lieutenant Ellen Ripley. The rest of the cast is also excellent. The alien creature is really scary (one of the best monsters ever). 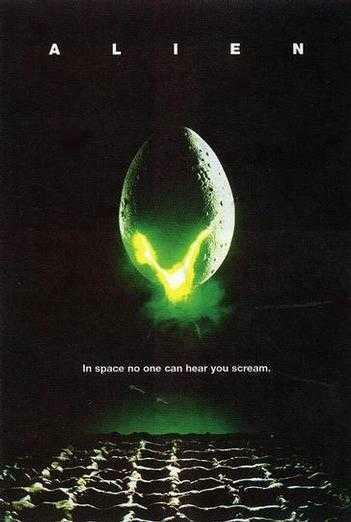 We do not see much of the alien, but it just makes the movie feels more creepy. Originally, the alien creature was designed by the Swiss surrealist painter and sculptor, H. R. Giger. Ridley Scott (the director) found out about H. R. Giger's work and decided to involve him in the creation of the movie. Besides the alien creature, H. R. Giger also designed the derelict spaceship. I watched the director's cut of the movie. Apart from one scene at the end of the movie, the director's cut is nearly similar to the original version (no spoilers here). This is a serious sci-fi movie (no funny Star Wars characters are introduced). The Nostromo spaceship looks like a flying refinery, and the crew is supposed to be "truckers in space". The movie was released in 1979, so the computers and the haircuts look different than today. Since its release in 1979, Alien has spawned three sequels. Alien has also served as a great source of inspiration for many filmmakers. The chestburster scene with John Hurt is probably the most famous part of the whole movie. Alien is one of my favorite sci-fi movies, and I still think this is one of Ridley Scotts' finest pieces of work (let us forget the crappy AVP movies).